I am a full time professional wood turner, specialising in using sustainably sourced woods and other materials. 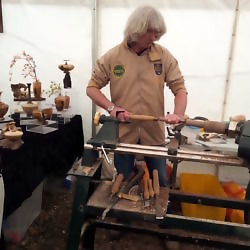 Whilst I use electric lathes, my work is traditionally based and covers a wide range of work from treen to crafting tools, decorative / artistic work to goblets made for use. I like to incorporate other materials in my work and this can range from metals to glass, bone, leather and fabric. Crafting tools and 'rustic' work emphasising the beauty in the wood.